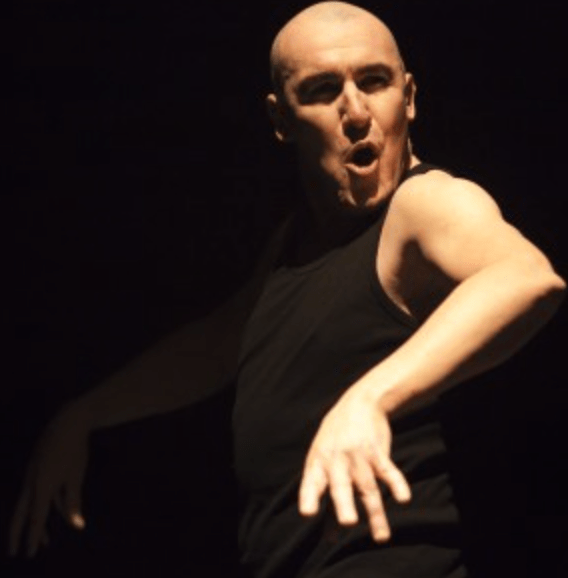 There is something telling about the connection between Rudolph Valentino, the inspiration behind Pat Kinevane’s Tino McGoldrick, a homeless Irish man on the edge of, if not undergoing, a break down during this 90 minute solo piece and who feels, continually, he does not exist so he is compelled to keep telling his stories. The early film star Rudolph Valentino died during a feud with an anonymous American editor over his masculinity and the charge that he had dragged American maleness into effeminate circles: here we have Tino McGoldrick, himself named after Valentino because of his parent’s obsessiveness, continually mourning the loss of his brother, who, in the words of the local nuns in Cork, ended his life with “a self inflicted act of cessation” after the community bullied him for being gay. But not only that, developing the Valentino theme of non acceptance, Kinevane, who writes and acts, tells the story through a succession of Valentino’s films, anecdotes and songs, incorporating the silent film style but as if a street performer, as though the only way Tino can be cured of his trauma over his brother’s suicide is by having this distant indirect street audience a witness to his pavement antics. We learn that Tino once had it all, once had a nice life, a house, wife and a son, yet his descent into drinking cost him that kind of stability. Catholicism also is never far away. It’s language and rhetoric haunts the text, as do religious images: Kinevane wraps his sleeping blanket around him like a shroud, when he sleeps he spread-eagles himself under it in the shape of the crucifix, his 90 minute monologue is a confession and the audience are his confessors. It’s also a relentless rant about perceptions and common misperceptions about mental health, more often illuminated through linguistic jokes. But this piece is far from maudlin. This is because Kinevane does not victimise McGoldrick, rather he imbues the character with all the brilliance of a James Joyce novel, with all the sublime descriptive adjective flinging passion of a passage out of Ulysses, with the same inimitable spirit and madness. It shouts out against the blind institutional dogmas of our religions, of our societies, of our hearts. We learn that there are nearly 1,000 homeless kids on the streets of Dublin. Through direct address we get to see, dimly in the darkness, how many of us have been on anti depressants. We experience the bitter irony of those institutionalised telling those who are ill to look after themselves, and then, when they fall even more gravely ill, that they have not looked after themselves enough. Part homeless mad man with an air of Michel Simon about him, part monk and holy fool, Kinevane combines cabaret with stand up comedy with extravagant story telling and yet elegant movement. He can’t go to sleep until he’s told his story, he can’t rest. Isn’t that the same with us all? Something always needs to be expiated and purged.